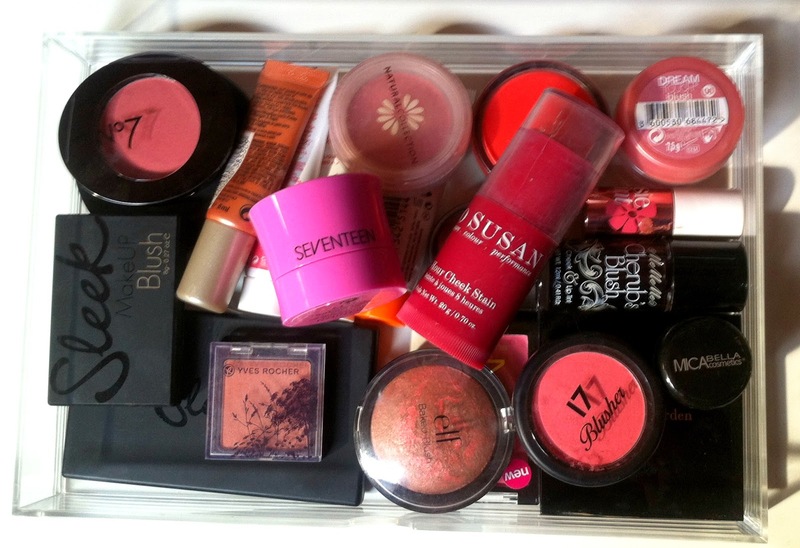 Hello lovelies, today is blushers in my make-up collection. I will start with my cream blushers and liquid blushers as I have been a huge cream blush lover at the moment, it seems to have taken over my love of powder blushes, I can't actually remember the last time I used a powder blusher as I keep switching my cream blushers around but without further a do here is my cream'liquid blush collection. My two favorite blusher's that I am always switching between is the Revlon photo ready cream blush in Coral Reef, this is a gorgeous coral pinky toned blusher that can be sheer or full coverage depending how heavy handed you are. I apply my cream blushers with my Real techniques buffing brush as I find this really easy to just dab onto my cheeks. My other favorite is So Susan 8 hour cheek stain, if you didn't have a brush you could easily just dab this onto your cheeks but I much prefer using my brush, a very subtle red with undertones of pink that gives you that healthy rosy glow, it does last all day and I just love it. I do love the Max Factor miracle touch cream blush in soft murano also but I like wearing this in the winter months as it gives me a nice healthy glow but a bit more of a deeper rouge sort of colour. I will be looking forward to using the Maybelline Dream touch blush in 06 in the spring summer season as it is a beautiful pink that pops your cheeks with a hint of shimmer. 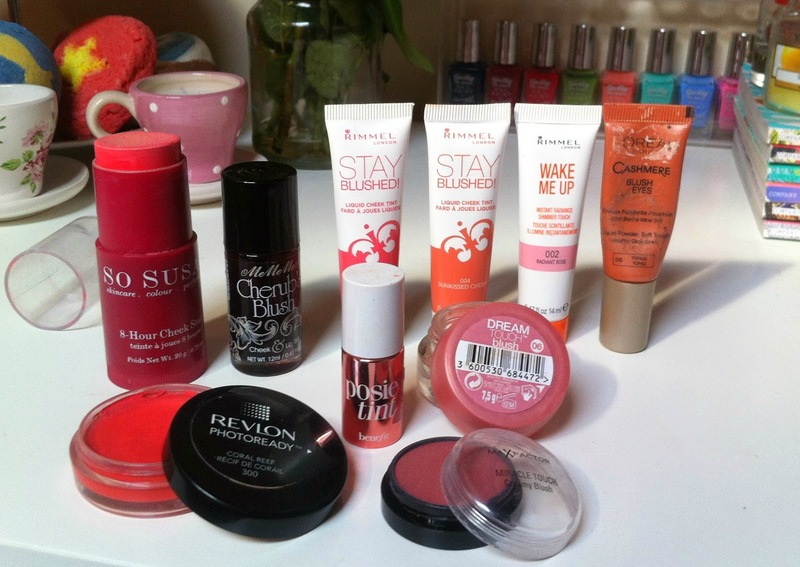 Also for spring I love the Rimmel Stay blushed liquid cheek tints, I have actually reviewed them HERE. L'Oreal Cashmere blush and eyes, I have never used this on my eyes as I don't think I would suit this colour on my eyes but it is lovely on the cheeks a gorgeous topaz sort of colour, great for a summer bronzey glow to your complexion. Then the others I haven't tried, I just can't get round to using liquid blushers I think I need to watch some youtube videos on it shamefully, just the whole concept, the nail polish like brush applicator it's just strange but I do want to use them, maybe they will be my next blusher addiction? I don't actually own any high end blushers as I don't think I need one, your looking now thinking isn't that Elizabeth Arden, your right but I can't count that in as I got it for a bargain price at fragrancedirect! A blusher is a blusher to me, a powder you put on your face. I am not judging anyone who does buy expensive blushers fair play to you, I am lured in by the Benefit blushers but I just can't justify the price of them as I am hit and miss with powder blushers now I'm a cream blush kinda gal. 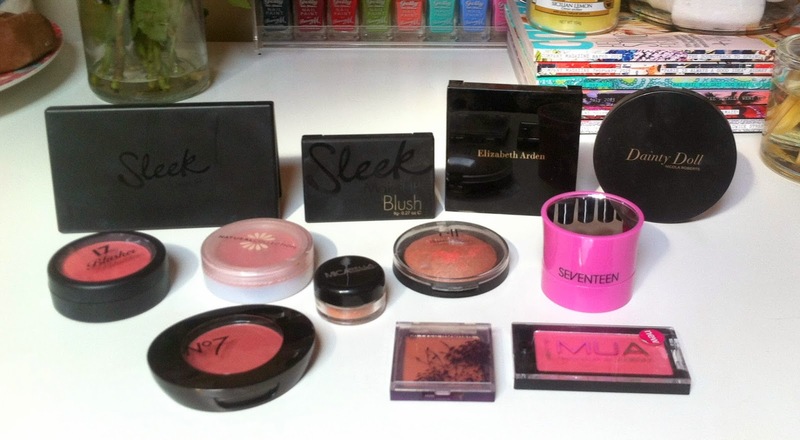 I love every single one of my collection here though and have actually used them all, yes applaud me. Cheaper than chips blushers I love, MUA the best bargain ever at £1! You wouldn't expect a lot from a pound blusher but it is pigmented and lasts a good few hours! The Natural collection blusher I own as you can see I love as I have hit pan a gorgeous peachy pink toned blush that really compliments my pale skin tone. Elf is another cheap brand that never seems to disappoint, this is a gorgeous blusher with gold flecks in it to create a gorgeous shimmer that you could use as a highlighter too. Seventeen do a lovely collection of blushers for under five pounds that are pigmented and last hours I love the one I own, a deep pink that is lush. The new edition to the Seventeen blush collection though 'the stamp' is inventive and cool but it tricks you, you swatch it on your hand and you think oh this is quite sheer it doesn't look at all like the scary colour on the sponge, so you have a good strong dab on your cheek, then your like WOAH what the, you have a big pink splodge on your face, so not cool. So next time I will definitely be applying it a lot more gently. Sleek is middle range priced not too cheap not too expensive, just right. 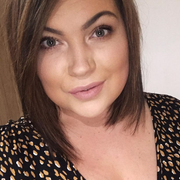 They offer some great products, very pigmented blushers I am loving the trio you see up there perfect for on the go or your away for a weekend so you have some choices rather than lugging your blushers around with you, you have a trio on hand. If you would like to know about any of the blushers in more context then please just leave your thoughts in the comments and I will be happy to add more information about them to this post. 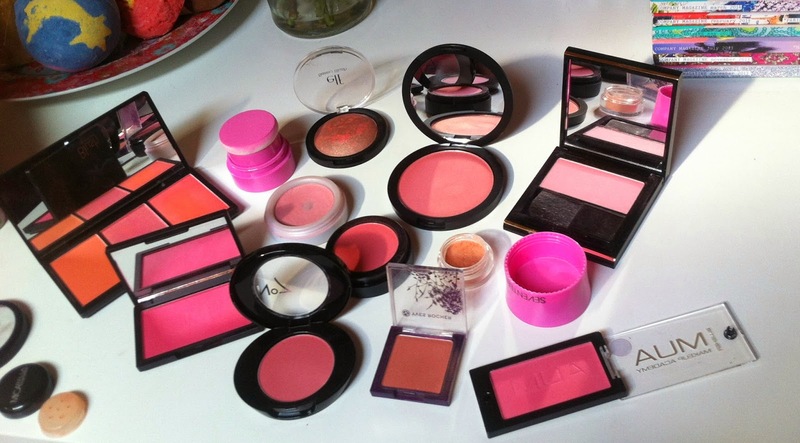 What is your favorite blusher brand?